How Do I Remove a Murphy's Product From My Store? If there are any Murphy’s products you don’t wish to carry on your website you CAN NOT simply move them to trash because when your website syncs with Murphy’s the product will be added back to your website. In the Publish section of the product page click the Edit button on the Visibility row to display the Visibility options. 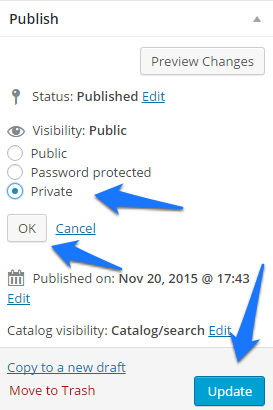 Select “Private” in the Visibility section. Choose an image from the Media Library by clicking on it. Click the blue Use image button at the bottom of the media library window. Back on the categories page, you should now see the Thumbnail image you have selected. Click the blue Update button to save.